When fresh green beans are cooked perfectly, you can taste their fleshiness and sweetness. 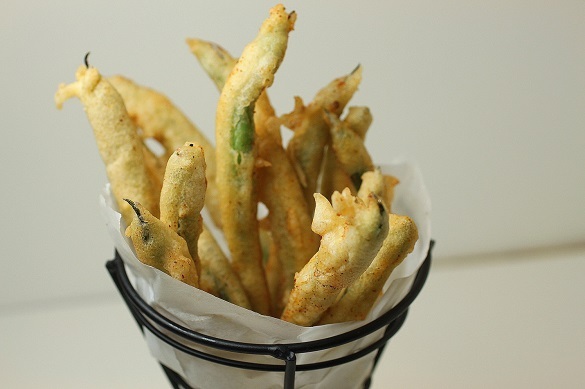 I like my green beans fried in a tempura-style batter that’s light and fluffy. I use my SYD Hot rub to give it a little kick and you can serve it with some Ranch dressing on the side. 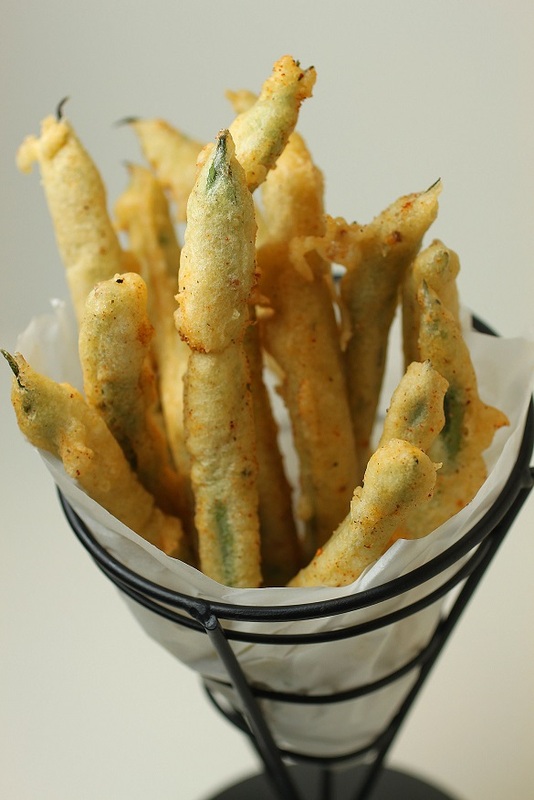 This dish makes a great snack or appetizer entre. The fluffiness comes from combining cornstarch with flour and adding some baking powder to make the batter crispy. The sugar adds a very slight sweet note to enhance the flavor of the beans. The egg yolk helps to bind the ingredients together and gives the batter an appetizingly nice yellow color. The secret is to use ice cold water to mix the batter with a fork and don’t try to completely dissolve the dry ingredients. Some lumps in the batter result in a more crunchy texture. You can even sit your batter bowl on top a bowl of ice to keep it cold while you’re cooking a big batch of crispy green beans. Use clean vegetable oil and skim the bits of batter from the oil so they don’t burn. The amount of ice-cold water you add to the batter will determine how thick the batter will be and how much of it will coat the green beans. Some folks like a very light batter so the green bean are not thickly coated. Some folks like the opposite and like the whole bean completely covered in batter. Try it both ways, thick first, and then thin out the batter with more ice water to see what you like best. As soon as the beans come off the hot oil, be sure to season with more rub while they are still hot.